What is a current support level in the US stock market and how likely is it going to stay above? Christmas time period is usually rather bullish for a stock market, which we cannot really say this year. The financial markets in the United States and Europe are experiencing the lowest valuations since February. During the recent years, the technology sector and specifically FANG stocks successfully managed to drag the stock market price from the corrections, while during the bull days their value was steadily increasing on relatively low volume. This is not working anymore. Even though the earnings are still good, the stock market is going sideways. Even though the fundamentals and macroeconomic elements show good numbers, the stock market is sliding its very important support level. Let’s see where the current support is and how different time scales are demonstrating a trading mood around the Christmas tree. The stock market has started the current correction at the beginning of October when the price sharply decreased forming a bearish channel. Subsequently, an increased optimism of bulls managed to lift the price higher and the response of bears lower – forming a sideways trading stock market with very clear support and resistance levels. A 20 period moving average demonstrates a significant separation in a bull-bear fight. 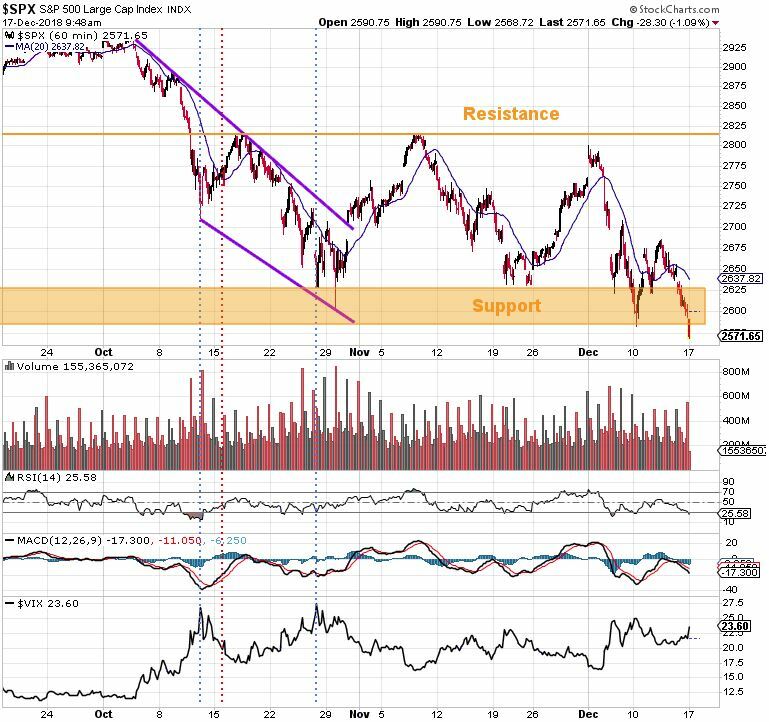 The resistance is an upper orange line and support is a lower orange rectangle. The rectangle because in this type of correction the support level is usually represented rather by price range than a clear price line. Thus, as we have already mentioned this last week, the current support is between 2580 and 2630. Such a short-term view of 3 months allows us to recognize this much better. The stock market has clearly erased all the gains it has managed to acquire since the February correction. The price is at the same levels now as it was at the deepest point of the previous correction. This is an interesting area and certainly lucrative position for bulls, if this was the bottom and another super crazy bull market is about to happen, this is just the time to go long. However, the probabilities of such scenarios are quite low at the moment. We would need to see some signs of the bottom that have already occurred -we did not yet. I have already published an article how to spot a bottom. This has not yet happened. 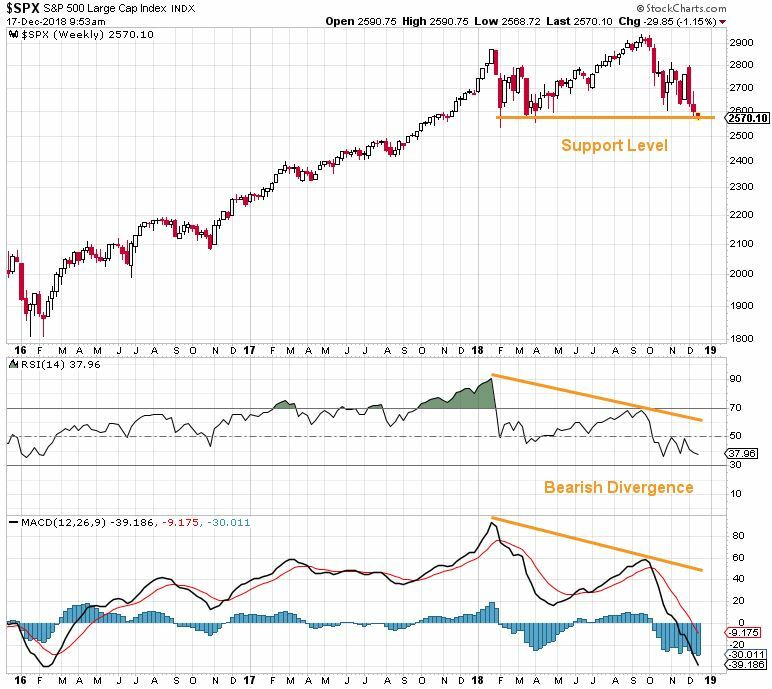 The likelihood of a possible bear market is increased by an observation of two very important technical analyses – RSI and MACD Bearish Divergence. Below you can see a clear demonstration of bearish divergence of 11 months’ time range. The view on stocks in 2019 is not very favorable. The trading activity is going to be certainly volatile and only the value-focused stocks will perform well. The investors should re-balance their portfolio and focus also on gold and commodity-related investments.